Minninglow embankment - one of several on this stretch of the CHPR, faced with 'dry' limestone blocks. 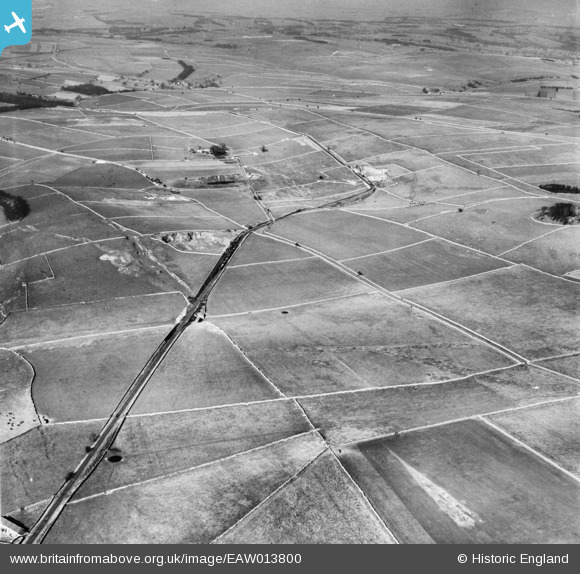 These embankments allowed the railway to maintain a level alignment across the dips in surrounding moorland. Minninglow Wharf on the Cromford & High Peak Railway - actually a short siding on the single line used occasionally for milk traffic. There was ungated crossing over the lane at this point. Pipers Inn was about here- this remained the main Manchester to Derby road until the mid 18th century. Line of Roman road Mamucium ad Derventio. Gotham Curve (the tightest bend on British Railways except for sidings) was half a mile beyond this minor devil. ex-North London 0-6-0T. Most of the wagons appear to be empty. Dew pond. These round ponds are common in the Derbyshire landscape. There are at least two visible in this photo. Water for livestock can be short in limestone uplands, and these were dug and lined with puddled clay to gather rainwater. Raining for a savey day?